Moose has taken a fantastic gallery of images from NAMM, found at MIDIZoo.com, and clearly is attracted to a lot of the same stuff as Team CDM. Now, here’s a tantalizing banner for fans of analog synths and early MPCs. The mock-up revealed some of the basic features planned for the BoomChik, though these may change in development. Most exciting: it’s a hybrid digital / analog drum synth, with four analog voices and one digital voice. Half of the unit is a 4×4 set of pads, while the other half handles sounds and recording facilities. The front panel also shows effects (delay with feedback, resonance, reverb, etc. ), a resonant low-pass filter, and distortion. Pricing/Availability: A represent of Dave Smith has confirmed to CDM that the product is planned, with an expected release in about a year and a price range somewhere around US$1000-1500. The BoomChik is described as “very early in development,” though, so all features, product design, pricing, and name are subject to change. That said, this looks well worth waiting a year. A lot of us have lost interest in MPCs, given greater production flexibility using tools like Ableton Live. But nothing differentiates hardware like boutique gear, brilliant designers, and analog sound production. 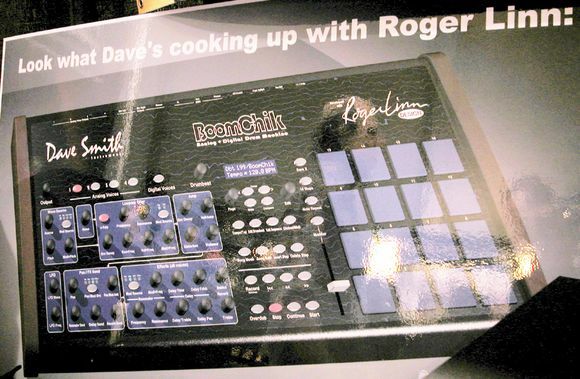 So, Dave Smith / Roger Linn: we’ll be waiting patiently, and eagerly await what you cook up! Elsewhere: Music thing got the jump on this, but for some reason most of the readers there hate it. Linn lovers in particular, shield your eyes.